This is a follow-up to a post on The Aperiodical about a Many-to-many Shape Sorter. The post is about designing solids which look like different shapes from different angles. After reading it, I came up with a solid that looked like a circle, a square, and a hexagon when viewed along each of the principle axes. A key part of figuring out the solid was looking at the diameters of a (2D) shape and realising that any sufficiently reasonable shape will have two orthogonal diameters of the same length. In explaining my design in a comment on the original post, I remarked that this was a consequence of the Intermediate Value Theorem. In the interests of completeness, this is a write-up of that statement. We first need to define what we mean, in this article, by the diameter of a shape in the plane. 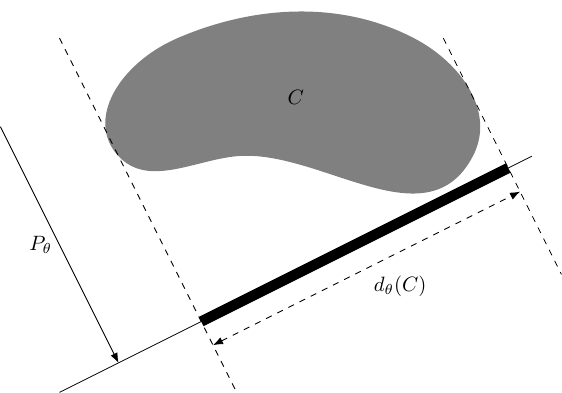 We do not mean the distance between two points in the shape, but rather the length of its "shadow" when projected onto a line. Let A⊂seteq;&Ropf;2 be a bounded connected subset. For θ&Element;S1, let Lθ be the line through the origin at angle θ to the x–axis. Let Pθ&colon;&Ropf;2&rightarrow;&Ropf; be the orthogonal projection onto Lθ. The diameter of A at angle θ is the length of the interval Pθ(A). We shall write this diameter as dθ(A). The result that we want to show is that a "reasonable" shape has two orthogonal diameters that are the same. We focus on the boundary of the shape as the shadow cast by a bounded shape is the same as that cast by its boundary. The proof is similar to that of "stabilising a wobbly table". The idea is to consider pairs of diameters for orthogonal angles. As we rotate the shape, these diameters vary continuously. After rotating the shape by a right-angle, the original diameters are swapped. This means that there must have been a rotation where the two diameters were the same. The key is to show that the diameter varies continuously. Let C be a simple, closed curve with a continuous parametrisation. Then the function θ&map;dθ(C) is continuous. Let r&colon;[0,1]&rightarrow;&Ropf;2 be a parametrisation of C. As the shape is closed, we have r(0)=r(1). is continuous as a map from S1 to C([0,1],&Ropf;). This is a standard result in functional analysis (with overtones of category theory). For completeness, we shall prove it at the end. and similarly for the minimum. This is precisely θ&map;dθ(C), and so this function is continuous as required. and hence that C has two orthogonal diameters of the same length. In the category of topological spaces enriched over itself, compact Hausdorff spaces are exponential objects. This is the sort of result whereby if you understand what all of those words mean, you are probably already sufficiently familiar with it that you don't need to see a proof here. We will therefore prove just the result we need in more elementary language. The map is defined in the obvious manner: given f&colon;S1×[0,1]&rightarrow;&Ropf; we define f^&colon;S1&rightarrow;C([0,1],&Ropf;) by f^θ(t)=f(θ,t). The inverse is: given g&colon;S1&rightarrow;C([0,1],&Ropf;), define ǧ&colon;S1×[0,1]&rightarrow;&Ropf; by ǧ(θ,t)=gθ(t). Assuming that these are well-defined, they are clearly inverse to each other. For θ&Element;S1, t&map;f^(θ)(t) is continuous. The map ǧ is continuous. The maps f&map;f^ and g&map;ǧ are continuous. Once it is established that they are well-defined, it is enough to establish that, say, f&map;f^ is an isometry. As everything in sight is a metric space, we will use the characterisation of continuity as that of taking convergent sequences to convergent sequences. Fix θ&Element;S1 and f&Element;C(S1×[0,1],&Ropf;). Let (tn)&rightarrow;t be a convergent sequence in [0,1]. Then the sequence τn=(θ,tn) is convergent in S1×[0,1] with limit τ=(θ,t). As f is continuous, f(τn)&rightarrow;f(τ). Then f^θ(tn)=f(θ,tn)=f(τn) and so f^θ(tn)&rightarrow;f(τ)=f(θ,t)=f^θ(t). Hence f^θ takes convergent sequences to convergent sequences, whence is continuous. Fix g&Element;C(S1,C([0,1],&Ropf;)). Let (τn)&rightarrow;τ be a convergent sequence in S1×[0,1]. Write τn=(θn,tn) and τ=(θ,t). Then (θn)&rightarrow;θ and (tn)&rightarrow;t.
Therefore as (gθn)&rightarrow;gθ and (gθ(tn))&rightarrow;gθ(t) we have that (gθn(tn))&rightarrow;gθ(t). Hence ǧ is continuous. To show that f&map;f^ is an isometry, we just need to consider the definitions of the norms on each side. Hence f&map;f^ is an isometry and so as it has an inverse it is an isomorphism.